The SPARK 3 bike carrier features lockable and easily-adjustable frame holders with soft pad for better protection. It's also foldable and space saving, and comes with a tilting platform function for tailgate access. 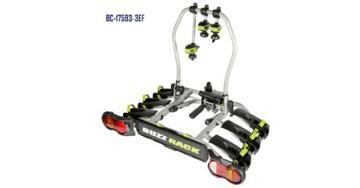 The bike carrier's wheel support design enables adjustments to fit most bike sizes. Its quick releasing ratchet straps provides easy fitting for different rims and tire sizes. The SPARK 3 is compatible with 29’’ tires wheel base up to 119cm, including 10’’ tires children bike wheel base up to 102cm. For tow ball systems, the SPARK 3 features a quick releasing cam lever system with integrated lock for better safety that can easily fit any ISO50mm tow ball. Optional loading ramp and fat bike kit accessories are available for tire width up to 4.6’’ and effortless bike installation. The SPARK 3 is made by King Rack Industrial Co., Ltd., a Taiwan-based manufacturer. The company specializes in bike carriers, roof racks /baskets, pet carriers and other automobile accessories. King Rack has been serving customers for more than twenty years, providing complete solutions from product development, tool design, punching, bending, welding, e-coating, powder coating to final assembly. Always adding more value to its products with strong in-house R&D capabilities, King Rack has successfully obtained more than 50 patents for its product innovations. Quality, safety and innovation are the business philosophy of Mr. Wang, who founded King Rack Industrial Co., Ltd. in 2000 and continues to use his knowledge and experience to perfect every King Rack product to this day. Source: King Rack Industrial Co., Ltd.